The fact that it has "II" in the title and people still confuse it for a remake of the first one shows how poorly it connects to it and how much it mirrors its plot. Still, this is a great horror flick that somehow manages to amp up the ridiculous gore of its predecessor while also adding lots of delightful absurdist horror-comedy that always keeps you on your toes and thoroughly entertained (see the possessed hand bit, laughing home decor). One-liner-spouting Ash is glistening and great. Okay, so I know this is really just the first one, done on a bigger budget, but that’s probably why I love it so much. Raimi and Campbell are again...phenomenal. One of the best duos in the film industry that I’ve ever seen. Much like the first, people do say it’s quite dated, especially in its affects, and that’s understandable, but I love it no matter what. These movies are why I still give a lot of horror films a chance in today’s film industry. It’s just so unique. 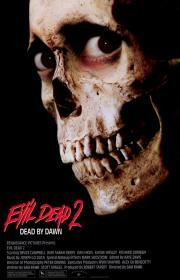 A film of endless energy and kinetic action that never slows down, Evil Dead II is a masterpiece of camp and horror-comedy. Bruce Campbell is the perfect performer for this material as it showcases both his charisma and ability to portray a manic man tortured by demons.